Shanghai: Ferrari’s Sebastian Vettel can complete a hat-trick of wins to start the season on Sunday but China also offers reigning Formula One champion Lewis Hamilton a perfect opportunity to end his rival’s run of success. The 33-year-old Mercedes driver has won the race on the outskirts of Shanghai an unprecedented five times, with the Briton’s most recent triumph coming as recently as last year. Hamilton will be desperately hoping the Shanghai International Circuit delivers a sixth as he bids to claw back some of the 17-point deficit to championship leader Vettel in the overall standings. “It’s always been a good track for me,” said Hamilton, who finished third in Bahrain on Sunday after starting ninth due to a gearbox penalty. “So I really hope that I’m able to climb the ladder and get back to where we’ve been working towards being in the last two races.” Wins in the Australian season-opener and Bahrain means the momentum for the moment is with Vettel, the first Ferrari driver since Michael Schumacher in 2004 to start the year with successive wins. The last time a driver failed to win the championship after winning the opening two races was in 1982, when Alain Prost started strongly but lost out to Keke Rosberg. Hamilton can still take comfort from last year, when he clinched his fourth championship despite Vettel also winning in Australia and Bahrain, which was the third race of that season. He can also draw encouragement from the speed and reliability of his Mercedes, with the Briton poised to set a Formula One record on Sunday of 28 successive races in the points. Hamilton had a clear edge over Ferrari in Melbourne and teammate Valtteri Bottas came within a second of snatching victory from pole-sitter Vettel in Bahrain. “That... was the minimum result we should expect with both Red Bulls and (Vettel’s team mate) Kimi (Raikkonen) out of the race,” Mercedes team boss Toto Wolff said. “So we started to analyse what went wrong in Bahrain in order to improve for China and come back stronger.” The defending constructors’ champions have won the Chinese race five times in the last six years, including four in succession, whereas Ferrari last won it in 2013. 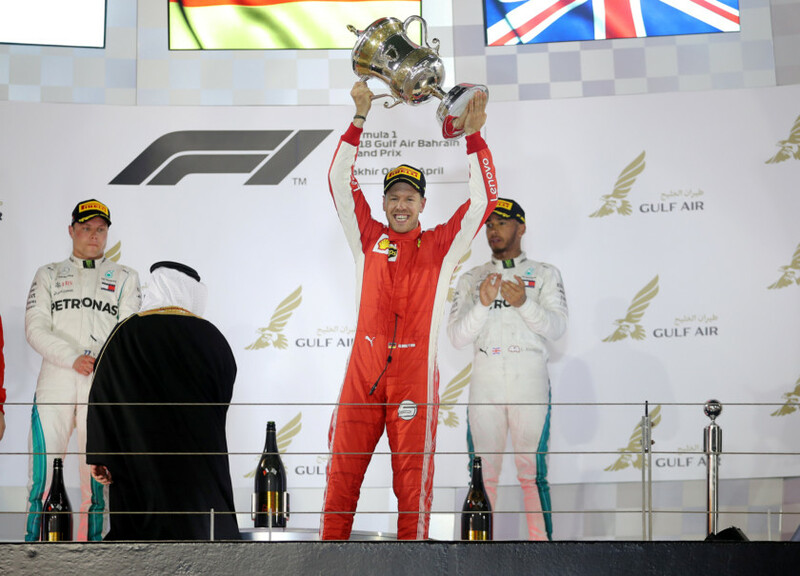 “It’s a tricky one to get everything right,” Vettel, also a four-time world champion, said in Bahrain. “But if we do, like this weekend, and we find the sweet spot, then I’m pretty confident that we can do well there as well.” Red Bull are also yet to show their hand, with both Daniel Ricicardo and Max Verstappen retiring in the first five laps in Bahrain. The former champions have finished on the podium in Shanghai in the last two years and could still make it a three-way fight.